Valve patient Norman Thorpe has been hard at work since his valve surgery in March. 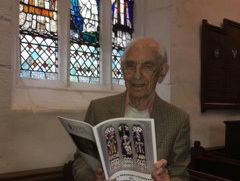 Not only has he been volunteering in his local mediaeval Parish church in the village of Whalley he has also penned a book containing a series of essays. The essays, originally written for the Parish Magazine, are all about the colourful history that surrounds the church, village and valley. Norman is very happy to have completed his book which is something he couldn’t have done without his life changing treatment. I’m very pleased to be able to tell people about my book which has been in the works for quite some time. I have been writing essays that have appeared in our Parish Magazine over the past five years and had compiled quite a collection. The essays have covered topics like the Civil War Battle in our parish, the invention of bottled beer, "burial in woollen" and even witch hunts. I had always dreamt of putting them together into a book but that plan had to be suspended when I had the trouble with my valve disease. Now that I’m back to my old self following my treatment, I have been able to complete my book and will be donating all of the proceeds back to the church. I have also managed to write ten more essays which will be featured in future Parish Magazine publications and maybe even a second book! In addition to my writing I act as a guide to the church. While it involves a lot of time on my feet, I really enjoy taking the visitors round the Parish Church and telling them about all of the history that once occurred here. In the last three weeks I have taken three different groups around the church and am looking forward to doing more. You can read Norman's valve disease story here.